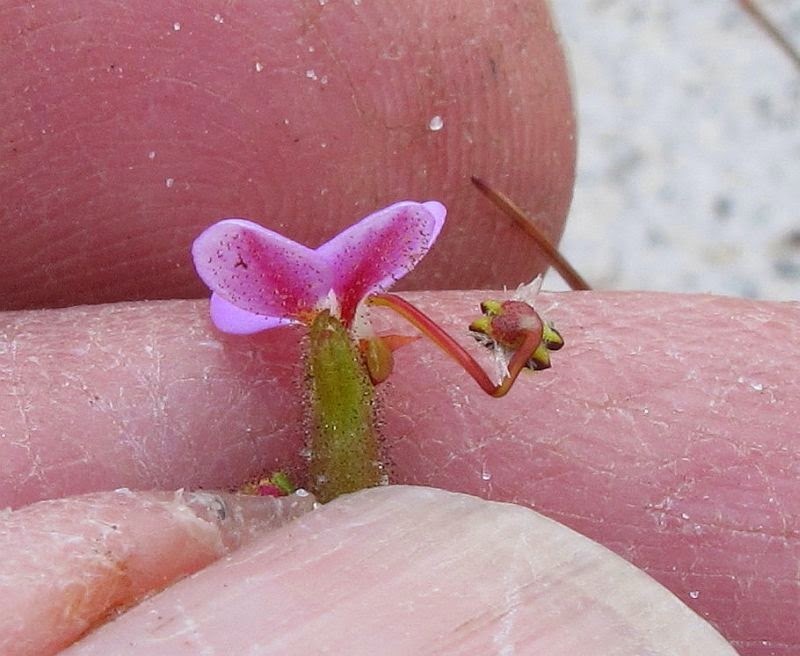 There are some plants, which are so common and widespread that you expect them to be published and the details readily available, well Stylidium turleyae is such a plant except there is no key to it that I have found, plus the journal in which it is published is not well known. The result has been many hours of research to track it down. I can remember the first time I encountered this plant, it was over twenty years ago to the NE of Mt Heywood (80 km NE of Esperance). For a few years beforehand I had been surveying this mallee region and knew it well, then a large bushfire passed through and what I had known was no more. However a completely different suite of native vegetation not seen before made an appearance, of which Stylidium turleyae was one of them. 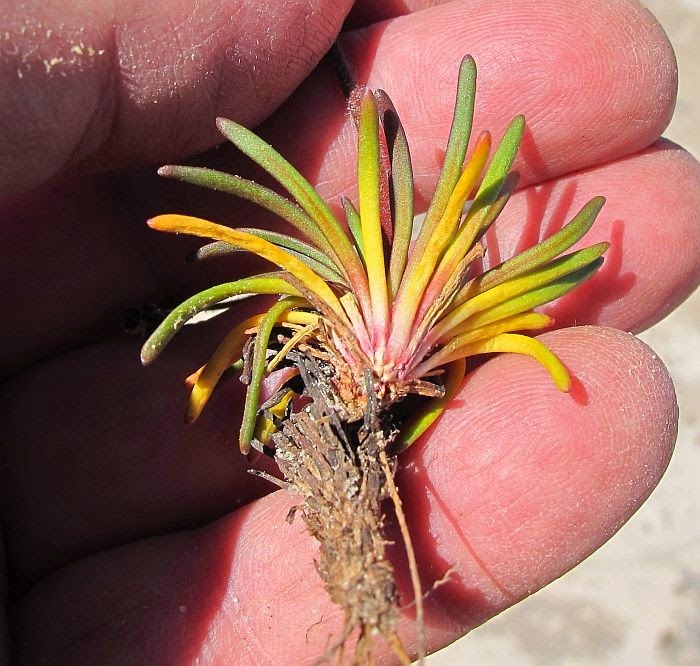 This species was extremely common in sandy loam soils over a wide area and were literally in their millions, yet I had not seen one before the fire. 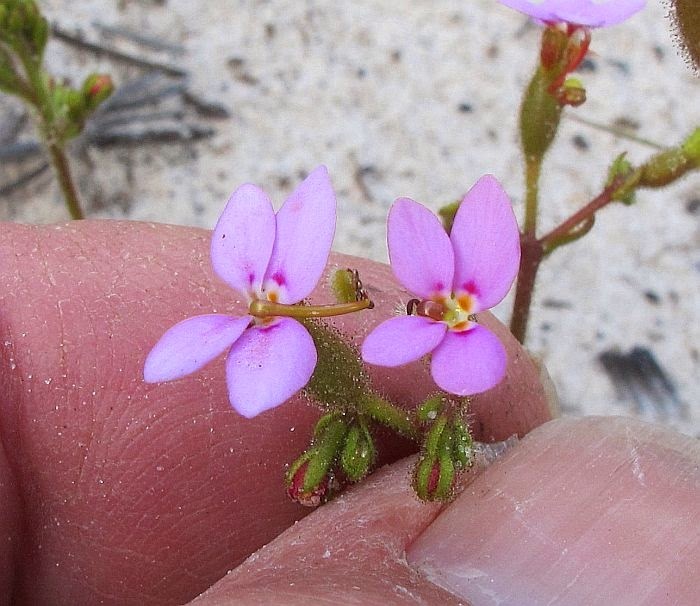 They remained around for 2-3 years, then started to disappear as larger vegetation began to establish themselves to deprive the Stylidium of light and moisture. Some plants remained for several years after the fire, but only in scattered small colonies and individuals that were either growing along the bush track or in a natural clearing. 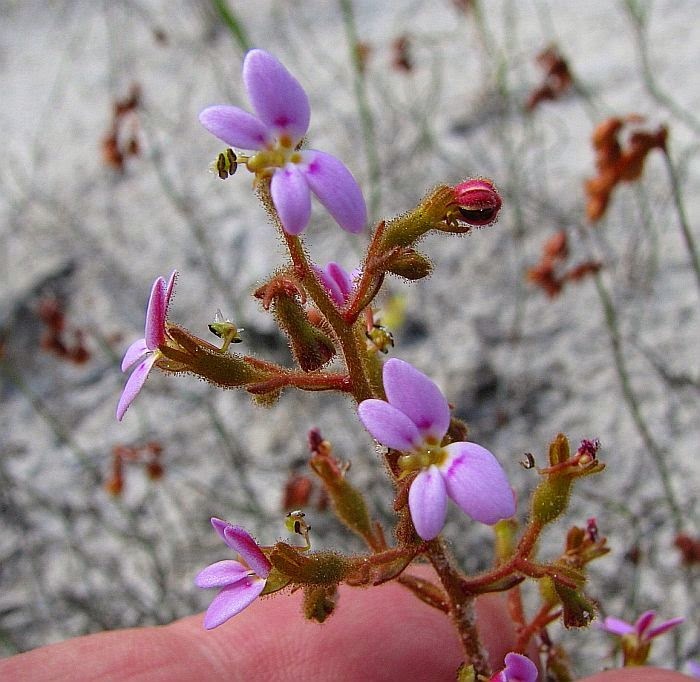 At the time of this post-fire discovery, I assumed it would be well known and its details published, but I could not locate it in any of the botanical publications available at the time. So I sent a couple of specimens to the herbarium, but heard no more. 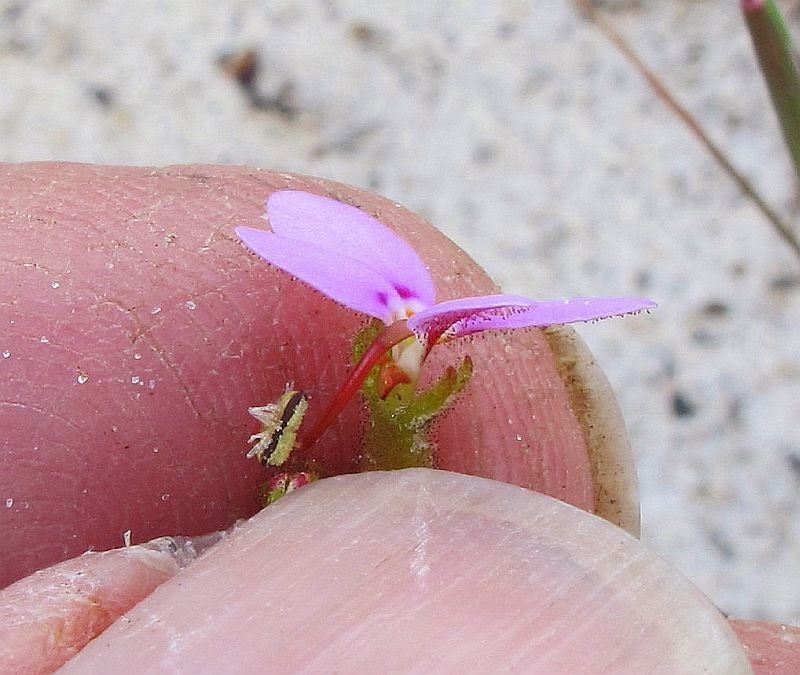 Since then I have encountered Stylidium turleyae on many occasions, but still I could not pin a name on it. This made me so determined to find it that I recently researched all the taxonomic botanical information concerning this genus available from the WA Herbarium, but still had no success. In utter desperation I started viewing each of the hundreds of species detailed by the herbarium; I started at (a) and it was not until (t) that I eventually found it. 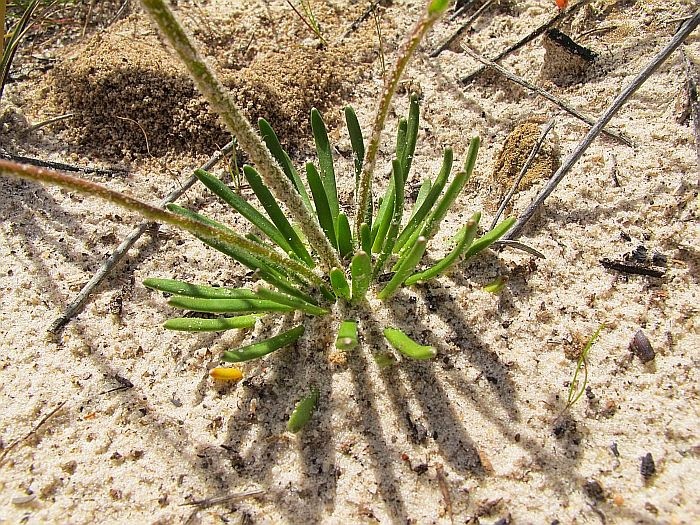 Unfortunately other than the actual FloraBase species listing, there appears to be no other reference to help locate it, which means you must know its name in order to find it, therefore a Catch 22 situation. 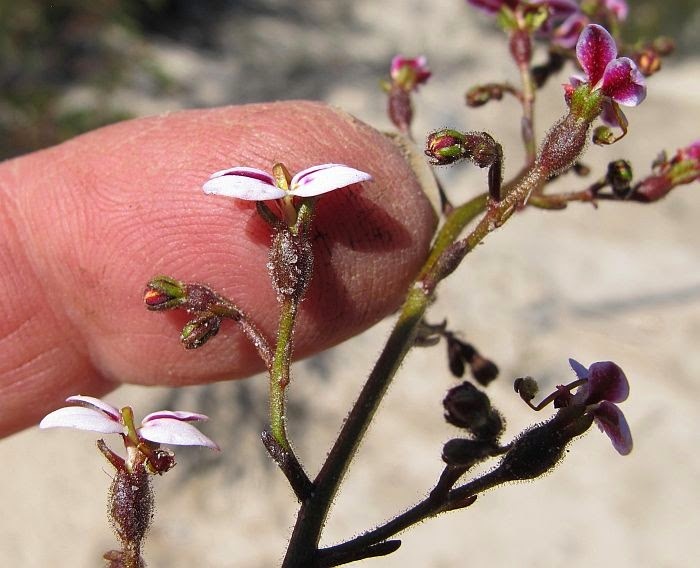 Stylidium turleyae was published in the WA Naturalist in 2004 (WA Field Naturalist Club), which has a limited botanical circulation and of which I am not included. Anyway after all of the above, I am pleased to have eventually located it, as it has been an irritation to me for a considerable period of time. 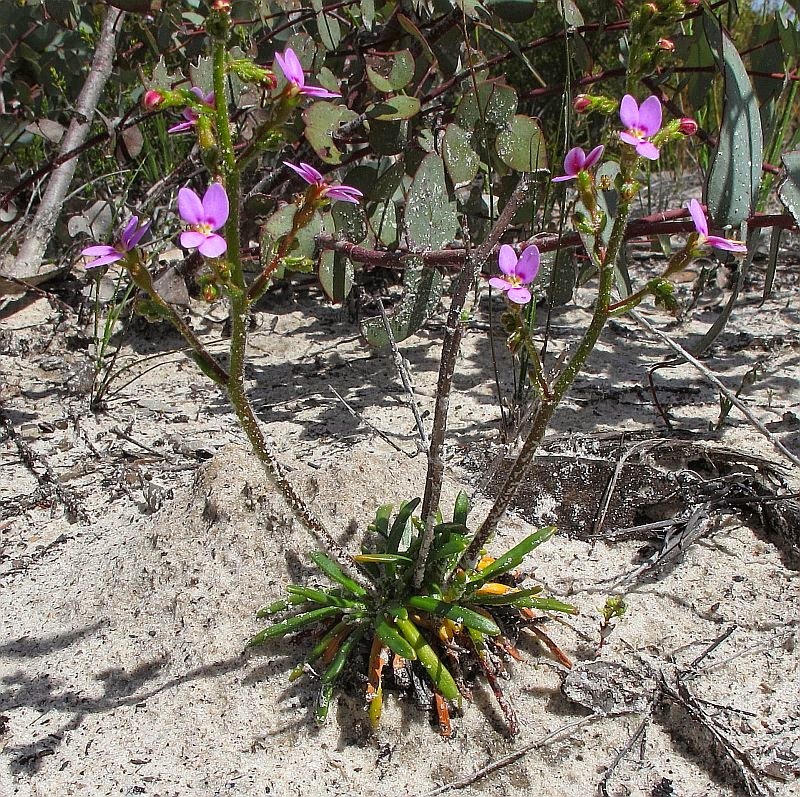 The plant as I have mentioned, is very common (for a few years) after fire and distributed from Lake Grace (west of Esperance) to Israelite Bay (east of Esperance), where it favours the inland mallee region, although it can also be found nearer the coast in non-calcareous soils. It mainly flowers (pink or white/pink) in September and October, but with good rainfall can also flower as late as December. In hot weather the foliage dies back to the rootstock to regrow when conditions improve. Stylidium turleyae is named after Coral Turley, an active member of the Esperance Wildflower Society (no connection to me or the Esperance Wildflowers Blog). Stylidium is the major genus of the Stylidiaceae family.